Radar observations made at Jicamarca show that the equatorial electrojet current and the E and F region electric fields can reverse from their normal direction during the day or night and during magnetically quiet or disturbed conditions. The nighttime reversals can only be detected by such radar measurements. The observations support most of the current hypotheses concerning the electrojet plasma instabilities. The rapid reversals sometimes seen during disturbed conditions indicate that high-latitude currents and electric fields associated with substorm activity strongly perturb the dynamo current system at all latitudes. Fejer, B. G., D. T. Farley, B. 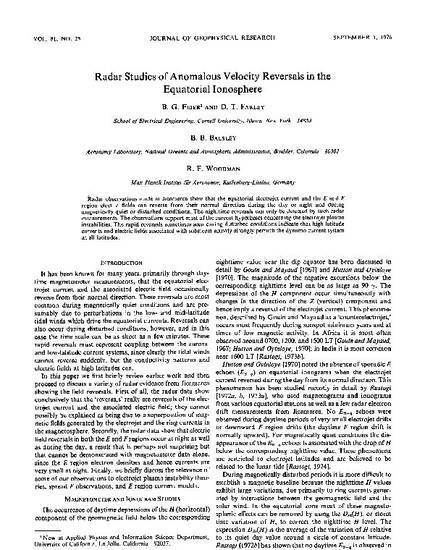 B. Balsley, and R. F. Woodman, Radar studies of anomalous velocity reversals in the equatorial ionosphere, J. Geophys. Res., 81, 4621, 1976.